The Les Paul Custom made its debut in 1954 after the initial success of the Les Paul Goldtop. Les Paul himself suggested black as a great color for a new Les Paul guitar because it went well with a tuxedo on stage. 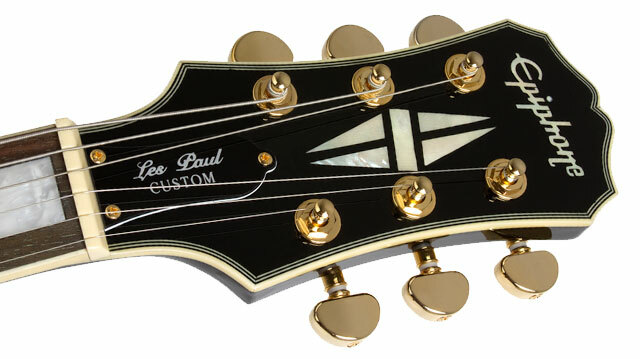 From that point on, the Les Paul Custom has often been referred to as the "tuxedo" Les Paul. And with its gold appointments, fully bound body, neck and headstock, and pearloid inlays, we think you'll agree that the Epiphone Les Paul Custom is "dressed to kill". And like every Epiphone, the Les Paul Custom features our Limited Lifetime Warranty backed by world famous 24/7/365 Gibson Customer Service. While all Les Pauls share common design features, the Les Paul Custom was made from solid mahogany, unlike vintage Les Paul Standards that were made from mahogany with a maple cap. Epiphone's LP Custom follows that tradition by using a solid, carved mahogany body which gives the guitar a slightly mellow tone. Like the originals, our Les Paul Custom is fitted with a solid mahogany neck and hand-fitted with a glued-in joint for optimum neck-to-body contact which allows the neck and body to resonate like one solid piece of wood. The neck features a very comfortable and fast "SlimTaper™ profile. The result is a tribute to Les' timeless guitar design with the sound and feel that you can only get from a real Les Paul. 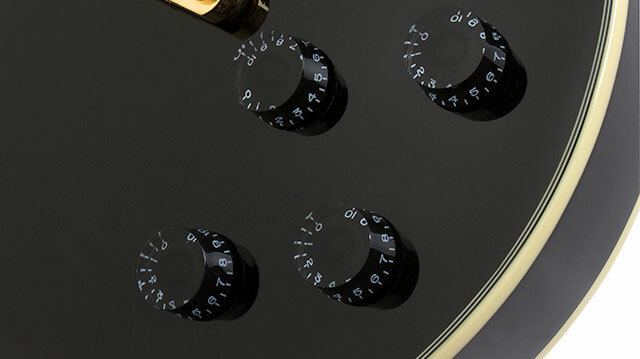 At the heart of the Les Paul Custom is a pair of Epiphone Alnico Classic™ humbucker pickups. Patterned after the original Gibson '57 Classics, these pickups combine Alnico-V magnets with enamel wire to give you a tone that is both warm and subtle with a full and even response that doesn't hold back when you need that classic humbucker crunch! The neck pickup is an Alnico Classic while the bridge pickup is an Alnico Classic Plus. The "Plus" is slightly over-wound for a higher output with all the rich, vintage tone of a classic humbucker. 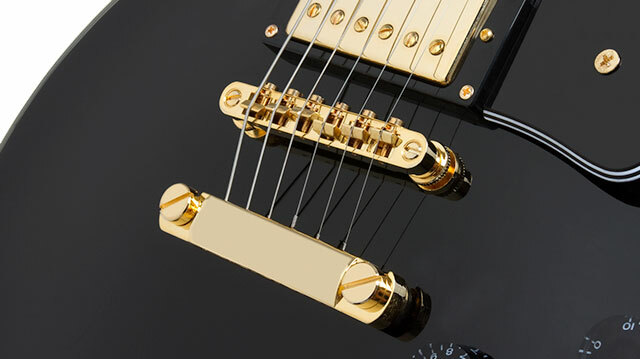 Other premium features include Epiphone's LockTone™ Tune-o-matic/Stopbar combination bridge and tailpiece for increased sustain and easy string changes, 16:1 ratio Grover® machine heads, a 7-layer bound body, a 5-layer bound headstock, and a comfortable single-layer bound rosewood fingerboard.